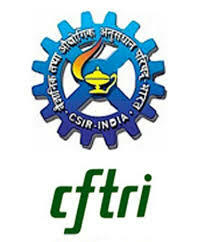 CSIR-CFTRI invites eligible candidates to appear for a Walk-in-Interview for a 1 [one] position of JUNIOR RESEARCH FELLOW on a temporary basis tenable at the Department of Molecular Nutrition, CSIR-CFTRI under the research project “To Study the role of ligand mediated interdomain communication to gain insight into the mechanism of regulation of FAD synthase from Helicobacter pylori” (GAP-0487). Venue : Department of Molecular Nutrition, CSIR-CFTRI, Mysore. Date & Time: 07.03.2018; 10.00 A.M. Desirable : Practical Experience in Molecular Biology/Biochemistry. Essential Qualification First class M.Sc. with NET/GATE/M.Tech or any other National level Examination qualified in Life Sciences. Interested eligible candidates may appear for walk-in-interview and report to Dr. Ravi Kumar, Scientist, Department of Molecular Nutrition, CSIR-CFTRI, Mysore on 07.03.2018 at 10.00 A.M. While attending the interview, candidates are requested to bring all the original supporting documents for date of birth, educational qualification, caste certificate (if applicable) and experience certificates for verification along with your complete Bio-data with e-mail address/contact phone number along with attested copies of the necessary certificates and passport size photo. In case, large number of candidates turn up for the interview, the candidates will be short-listed by a duly constituted Screening/Selection Committee and only short-listed candidates would be interviewed. Project entitled “Understanding key proteins/enzymes of probiotic lactobacilli involved in β- manno-oligosaccharides catabolism” (GAP-0523) funded by DBT, Ministry of Science and Technology, New Delhi, tenable at the Protein Chemistry and Technology Department, CSIRCFTRI, Mysore, Karnataka. Essential Qualifications: First class M.Sc. in Microbiology/Biochemistry/Biotechnology (with NET qualification) or M.Tech. in Biotechnology. Desirable: Hands on experience in Molecular Biology and Biochemistry techniques with good aptitude. Emoluments: Rs.25,000/-(Rupees Twenty Five Thousand only) per month plus 20% HRA. Eligible candidates may send their complete Bio-data with e-mail address/contact phone number along with attested copies of the necessary certificates in support of date of birth, caste, qualification/experience etc., as hard copy to Dr. Mukesh Kapoor, Senior Scientist, Department of Protein Chemistry and Technology, CSIR-CFTRI Mysuru–570020, Karnataka (email:mkapoor@cftri.res.in) on or before 09.03.2018.